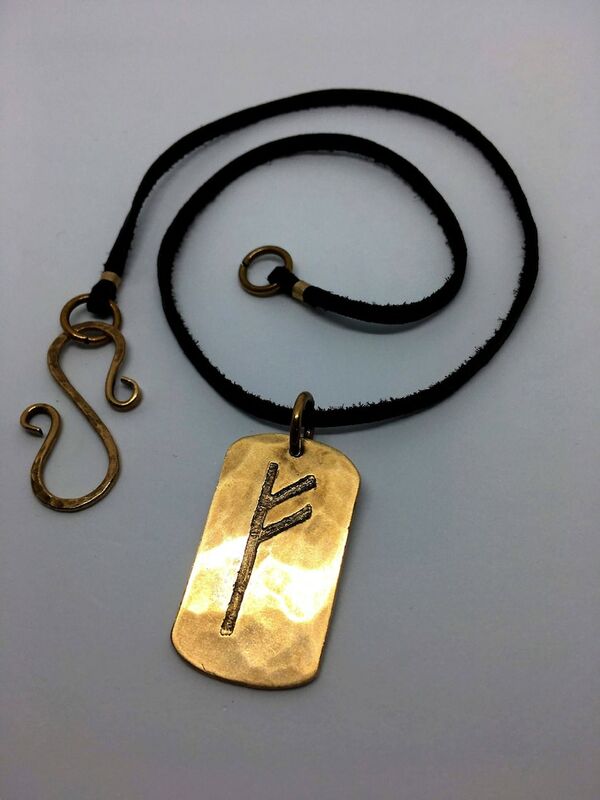 A fully handcrafted Rune talisman made from Bronze with YOUR CHOICE of rune from the Elder Futhark (the magical set of 24 symbols used by the Germanic tribes of Northern Europe since before the Viking Era) etched into it. Your Bronze pendant will be hung from 3mm wide brown deerskin Genuine Leather and clasped with a hammered Bronze s-hook. 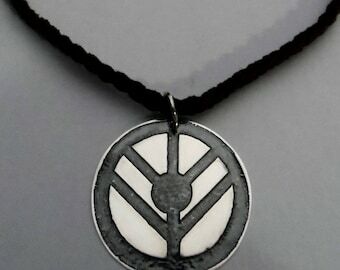 Pictured in this listing is the rune "Fehu" which is often worn for prosperity. Being prosperity monetarily, and also prosperity in the household or relationship. In the photos you will find a picture to enlarge showing the name of each of the 24 runes of the Elder Futhark, along with the distilled concept relating to each ancient symbol. 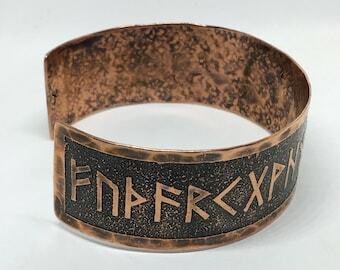 Each rune has an assigned phonetic value as well (if interested in ordering for that reason), relating to sounds that would have made up the language of Proto Northern Germanic (which pre-Viking age Scandinavians spoke before the formation of Old Norse). However like how today's language is formed like this: letters form word, words form sentence, sentence forms concept. 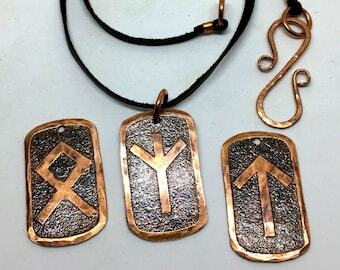 With the runes it is different, as each symbol IS the concept. 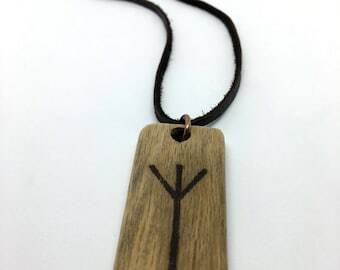 Those concepts were very important to the ancient Scandinavians and Vikings, primarily being carved into wood, metal, stone, or bone for magical purposes and talismans. 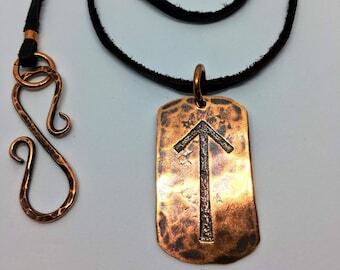 So find a rune that speaks to you in the photo, then select its name from the drop-down menu when ordering. 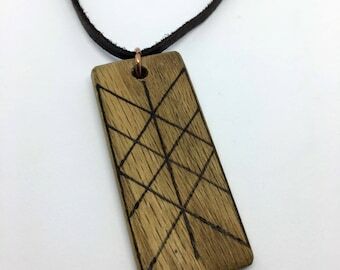 Necklace Length: 18" or 20"
**NOTE** Standard necklace length is 18" (including clasp), If you prefer 20" length please specify in a note when ordering. Otherwise you will be shipped the standard 18" length. If ordering multiple talismans, clearly specify the names, lengths, and quantity of each, if applicable, within the note. Fast delivery from the US to Europe. Super cute!!! I got this for Valentine’s Day and had it engraved with our anniversary date! Looks exactly like the picture. I can’t wait until he sees it. Justin was amazing and was quick to respond. Super patient with all my questions and pleasant to work with! Would definitely buy from him again. stupendo...fatto veramente bene,,,rame lucidato e rifinito in maniera eccellente..